It was practically the impossible dream, to think that President Obama could match the oratorical greatness of Dr. Martin Luther King’s “I have a dream” speech—even on the 50th anniversary of its delivery at the March on Washington. I would have been happy with something like a “state of the state of race in America” speech. But perhaps that would have been too policy-oriented for the occasion. So I’m settling for this: that the president did not forget us–Asian Americans. 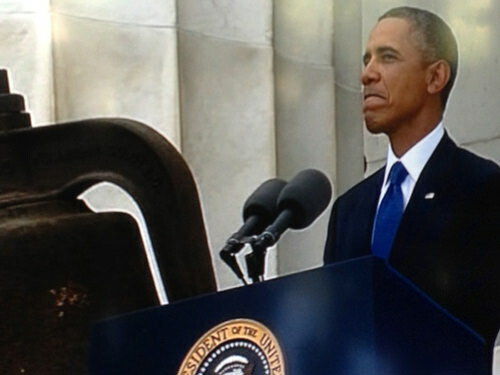 He was as inclusive in his speech as the modern fight for equality and justice is in our 21st Century America. And Obama was pretty clear about how it included all of us, by linking us to the marchers of 50 years ago. It’s a mouthful. But it was necessary. Indeed, it was what I found the most instructive part of his speech because he talked about empathy. Examples: The native born who recognize the pain of the striving immigrant. Or interracial couples who connect with the pain of a gay couple being discriminated against and see it as if their own. Left to right: The Endo family–Paula Endo (wife of Todd Endo), Erik Endo (son), Aidan Endo, 13 (grandson), Greg Johnson (nephew), Marsha Johnson (sister), and Todd Endo, who marched 50 years ago. Obama’s speech was good. Maybe not a great one–yet. But even Dr. King’s speech took some time before historians deemed it “great.” No one was fawning over “I have a dream” on August 29, 1963. What will determine greatness for Obama’s words will be the actions he takes from here on. Voting rights? Affirmative Action? Let’s see if this speech becomes the catalyst for decisive policy moves. I didn’t hear any other phrase or speaker that might capture the imagination. (Maybe Rev. Bernice King’s rant?) So at this event, it was important that Obama acknowledge that 50 years later, we’re talking Civil Rights 2.0. I know how much is different because I remember 52 years ago, when this picture was taken. 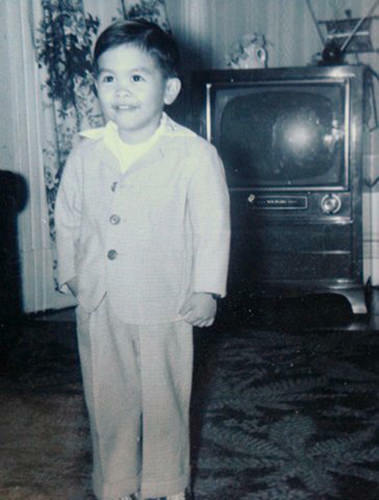 In my living room in San Francisco, I stood in front of a symbol of American attainment, a TV set with rabbit ears, and all in black and white. Just like the race issues. But as Asian Americans, my family was affected just the same. We were a Filipino American family living in the only place we could in San Francisco–the African American section, the Fillmore district. Next to the Japanese Americans. My father was a cook. Not a chef. A union cook. He had survived the tough anti-Filipino period in California in the ’20s, ’30s, ’40s, and ’50s– decades in which Filipinos endured everything from epithets and lynching to anti-miscegenation. As a child, I was protected by my parents from all that. I remember cheering for the Giants who won the National League pennant in 1962 behind my African American idols, Willie Mays and Willie McCovey. I vaguely remember the march as a major TV event, but King wasn’t one of the leaders. Frankly, I remembered even more a TV event later that year featuring Caroline Kennedy (who was at today’s ceremony). She was a child, like me, when her father was assassinated in November. So I know how 50 years have passed, and that much has changed. Filipino Americans, Asian Americans, blacks, and others are part of a large middle class, threatened but still there. And our society is an explosion of diversity, which makes race issues more complicated than ever. Fifty years later, the litany has expanded. Obama recognized that in his speech and urged us to have the courage to stand together. Sounds like a simple thing. But on this day, it was plenty.